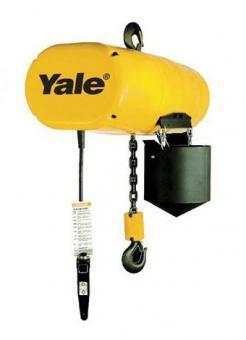 The Yale XL Electric Chain Hoist features: less maintenance & easier inspection, improved serviceability, longer service life, quieter operation, improved load safety, improved chain life, easy access control panel, eco-friendly, standard features. 5 Pocket Lift Wheel provides better chain and lift wheel engagement for smoother lifting and reduced vibration -- which equates to less wear and a longer chain life. Zinc plating to protect chain from environmental conditions. Lodestar exceeds H4 requirements, engineered for high duty cycles and the toughest applications. Lifetime grease-lubricated Gear Box means no changing and disposing of hazardous oil. Shipped in boxes made of recycled material. Fabric chain container and rigid hook suspension standard on every Lodestar. CSA/US National Recognized Testing Laboratory (NRTL). Variable speed drive (VFD) or traditional 2 speeds available. Primary and secondary transformer fusing. Rotatable limit switch - Designed for quick reset of limit position. Black phosphate or stainless steel load chain. Metal and stainless steel chain containers.